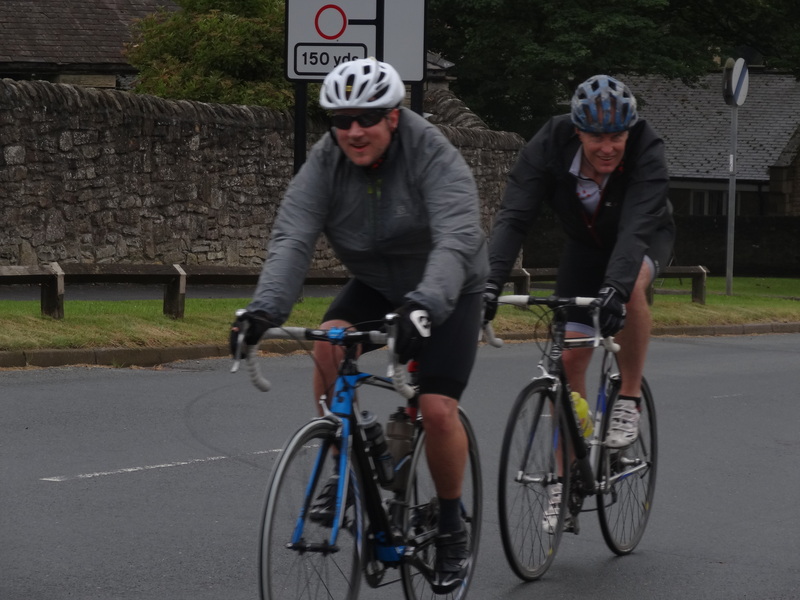 On Saturday 19th July, my husband Pete and his mate Ali embarked on a huge challenge of cycling coast to coast in a day. Almost 140 miles from Whitehaven to Sunderland taking in 9000 feet of climbing and some challenging weather conditions. Pete decided to dedicate his ride to his late Mum and raise money for the British Heart Foundation – to date he has raised almost £600. His Just Giving page can be found here. Here is his account of the day…. 4:30am the alarm went off. Quick shower, bike in the car and off to pick Ali up at 5:00. Arrived a little ahead of schedule at Whitehaven for the obligatory photos and dip of the tyre in the Irish Sea and set off in decent weather. 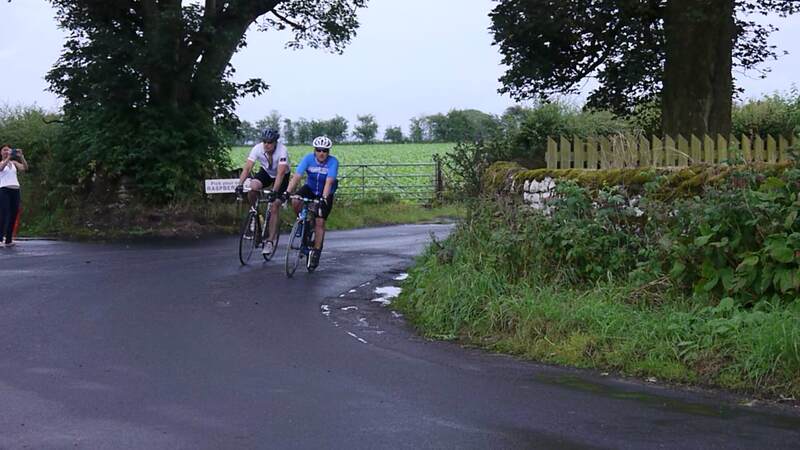 Made steady progress through the not so scenic cycle lanes of Whitehaven but it wasn’t long before we left the town behind and were out in the country climbing steadily but very gradually with the Lake District hills in the distance shrouded in cloud. A nice quick downhill somewhere near Loweswater and a nice coast by the lakeside before it turned up hill. A quick pause to check the map and the first of Yvonne’s home-made energy flapjacks. Helped out by a very nice lady who came out of her cottage to help point us in the right direction we set off up the road which was essentially the beginning of the climb up to Whinlatter. “Its pretty steep, but you’ll get used to that” she said as we clipped in and rode off. Yeah right. The climb wasn’t actually that bad and was definitely easier than in the other direction, so we hit our first break point at 9:45 still ahead of schedule, relaxed and good fettle. Got a coffee and read the paper while waiting for Yvonne to meet us as planned. 45 minutes later still no sign of Yvonne so we had made the decision to crack on when she turned up in the car park. She’d arrived at pretty much the same time as us but not recognising my dads’ car had gone looking for us out on route. By now the rain had started and we debated about whether to go with the jackets or not eventually deciding on not. Sped down Whinlatter (a new pb for me ) and onto the A66 bypassing Keswick with Ali doing a good job of work taking the wind up the drag to Threlkeld pulling himself inside out for the good of the team. Soaked through by the heavy rain and spray from the cars but not cold we pressed on the Greystoke. A quick stop dragged on a little longer than anticipated as the support team where not to be found in Greystoke although the cars were. Spotting a pattern yet? Refuel, jackets on as it was now pouring down and onto the next planned meeting point Langwathby. Nice section of the ride with some long cruising downhill bits and at one point the sun even came out. Slight detour to get back on track in Penrith and a short sharp climb saw us pass a few other cyclists and on to Langwathby and the tomato sauce pub. This was the last point where spirits where high for a good few hours. 55 miles in, elapsed time 5 hours. From here it was a 12 mile climb up to the top of Hartside. It started reasonable for the first few miles but the mileage was starting to tell in my legs but we did manage to catch a few others on route and pass them. As the road kicked up so did the heart rate and down through the gears. Soon found the lowest ring and it was just a case of spinning up to the cafe which you could see from a fair way out. At one point I could hear one of the blokes we’d passed catching me and his breathing was getting heavier and heavier and by the time he passed me he was blowing out of his arse. “Not far now” I said as cheery and controlled as could and I just got a grunted response. One of the highlights of the day was about 2 minutes later when I passed him again on the side of the road off his bike bent over double gasping for breath. “You alright there?” I asked in a ‘I couldn’t care less’ of way. Didn’t see him again until the cafe. Tried to refuel with some proper fuel but despite feeling Hungary could only eat half my turkey bap and chips. Changed into clean and dry socks and new top and off we went again on to Alston and up over Nenthead to Stanhope. 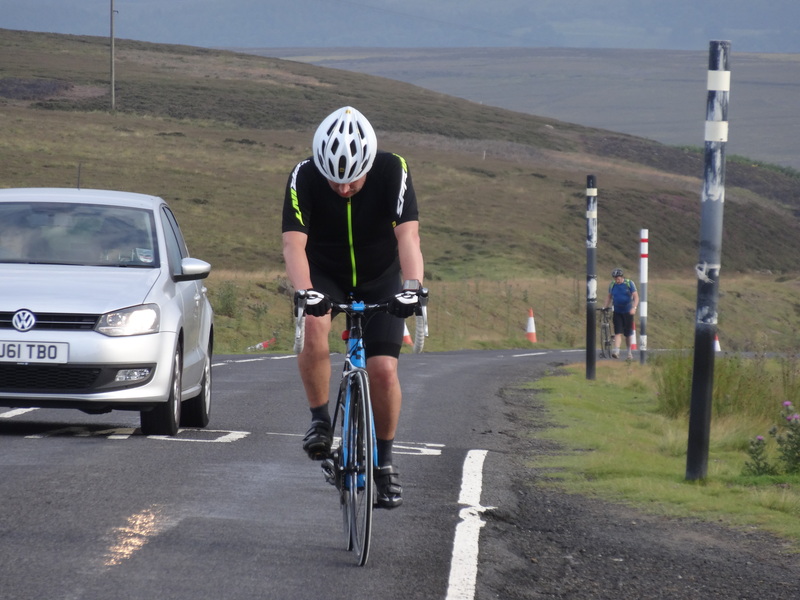 Needless to say this was the hardest part of the ride and the downhill from Hartside was soon gone followed by a seemingly endless uphill drag into and out of Alston. The only distraction being the cobbled hill climb in Alston to recreate (in my mind anyway) the recent tour stage. Out of Alston climbing continued, the weather was s**t, the wind got up, a head wind of course, and the first thoughts of packing in hit me. 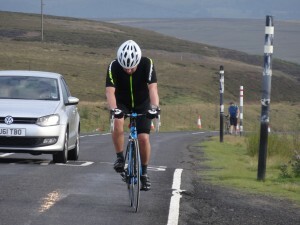 Kept on pedalling then the real climb up Nenthead to the highest point of the route started. Hitting 15% in places it was probably at this point that when I passed Yvonne and my dad cheering us on at the side of the road if they had suggested climbing off and getting into the car then that would’ve been it. Thankfully they didn’t and with the help of counting pedal strokes I carried on. On the last little ramp I finally succumbed to cramp in my hamstring and with a quick burst of stood up pedalling to stop it taking hold it subsided. A quick stop to neck the first 3 gels of the ride I pedalled to the summit. Another gel, a quick team selfie and a review of the map making note of the “do not miss this turning” turning coming up soon. So the usual benefits of a climb is a down and this was the case here, with a long fast downhill down the road with Ali speeding off into the distance. It was probably about 4 miles later that it hit me “s**t, we’ve missed the do not miss turn” finally got Ali to stop and we checked the map and could figure out where we were. Thankfully a guy with a mapping GPS passed us and reassured us we were still on the way to Stanhope. We ploughed on and hit the A689 so we could finally locate ourselves on the map. We’d gone wrong before even hit the don’t miss turn. 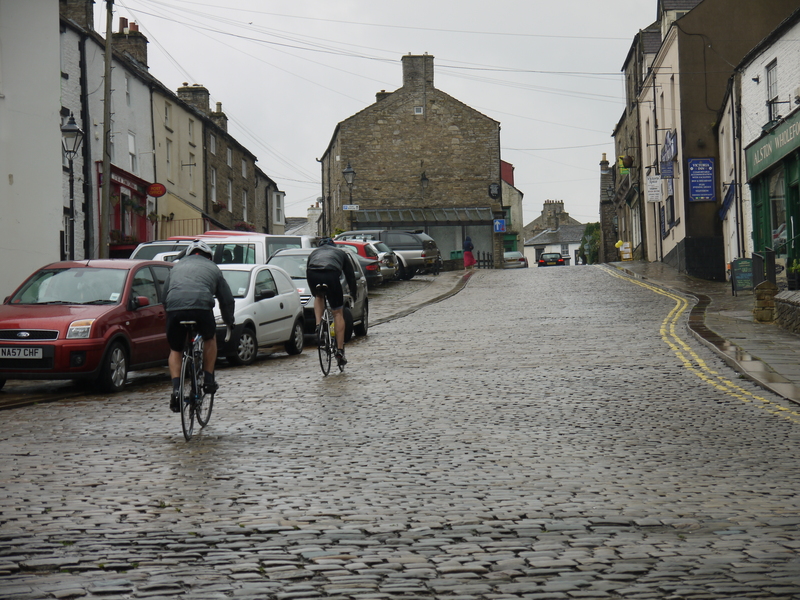 Called the support crew to tell them we wouldn’t be going through in Allenheads but they were already in Stanhope. A couple more sugary energy gels and we set off for the 10 miles to Stanhope, this was either pretty flat or downhill so we made decent progress with me finally putting in a decent spell of pulling at the front. The support team had swelled with Mandy and Will joining the cheering squad at the pub. Time for another rest more food and drink. Not much chat and spirits were low (from us anyway). At least the sun was out and it looked it would finally stay out. 97 miles done about 11 hours elapsed time (id given up counting the time at this point). So we eventually mustered up enough enthusiasm to get back on and tackle the last 3 mile or so climb out of Stanhope to the start of Waskerley way. After the initial steep bit it became a bit more manageable and was again buoyed by passing a couple of people of pushing. After a bit of debate about whether the Waskerley way was suitable for our road bikes we decided to give it a shot. After a mile or so it was obvious it was a good decision as the surface was good and the going was fast. We continued for a good few miles only stopping for the gates and with a quick drinks stop ploughed on in to Consett then through Stanley and Washington. The path was variable in nature but mainly pretty good and the end was in site when I got a puncture at the underpass of the A19 into Sunderland. We called for the team car for our spare tube and found a pub to wait with a pint, on credit as we had no money on us. My dad eventually found us and I fixed the flat. When we set off again it was getting dark but we only had 4 miles by the banks of the wear to go. We passed the stadium of light, the marina and by the time we reached Roker pier it was dark. Final photos, hugs and congratulations. 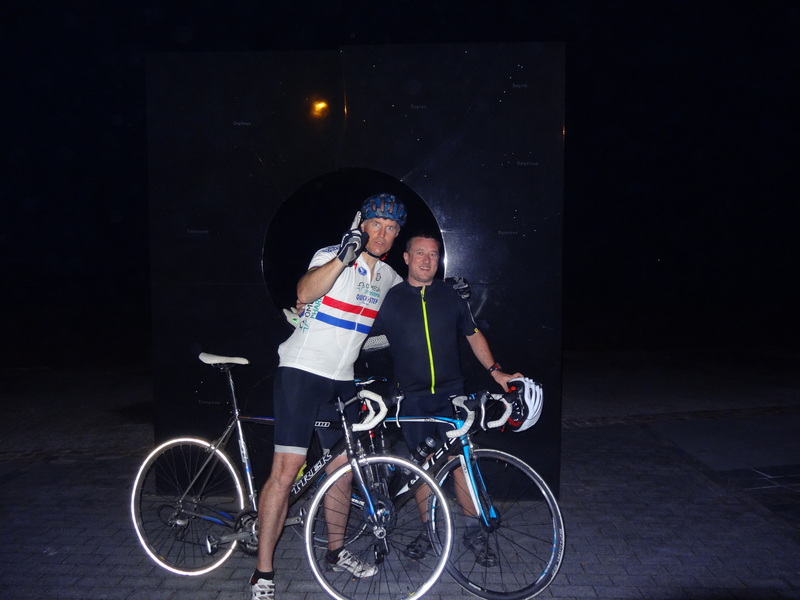 133 miles and just shy of 15 hours since we set off from Whitehaven we had cycled from coast to coast. In a day. Happy New Year – Here’s to a Healthy 2015! © 2019 Mandy Frost Sports Massage All Rights Reserved.